I hope you had a wonderful holiday! I took a mini staycation and binge watched some TV and actually read a novel! It was nice to take a couple do nothing days to myself. I did no cleaning or home improvement projects and I did no cooking or laundry. Heaven! I deserved some down time!! I hope you had a chance to do the same. I’ve been practicing my coloring and taking more classes. I found some online classes for using alcohol markers and decided to try a challenge. 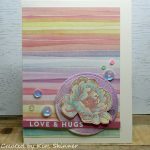 It turns out that it is Simon Says Stamp’s 9th birthday and the Simon Says Stamp Blog Wednesday Challenge for this week is a focus on Simon Says exclusive stamps. I have a couple (okay… many) Simon Says Stamp sets that I have been dying to play with. I decided to combine alcohol marker practice coloring with a Simon Says stamp set for the birthday celebration. I love the Cosmos Background stamp set that they came out with a month or so ago. I decided that I would heat emboss it in white embossing powder and then color in a blossom or two with my artist markers. I got carried away trying to get the flicking technique just right and colored in way more blossoms than I intended. Be nice…I’m new to alcohol markers as you know and this was a challenging one with all of the overlapping blossoms. I wish that I had watercolored it instead of attempting the alcohol makers, but honestly, that wish gives me another excuse to play with this stamp this weekend! I’m embracing the imperfections as I learn and practice new techniques! Isn’t that purple glitter paper fabulous?? That is actually a 1/2″ strip from a 6 x 6″ piece of Glitter Amethyst paper from Simon Says Stamps. They had a sale on it right after Pantene announced their color of the year. Could I resist purple sparkly paper? Of course not!! I love Simon Says glitter paper. It’s not as heavy a weight as some other glitter papers. It is soft and flexible and dreamy to use. Plus…that color. WOW! I really only meant to color in 3 blossoms. Then I ran out of time to color them all. It’s really hard to stop once you get started. It’s like eating brownies when the rest of the pan is still sitting on the kitchen counter. It’s hard to just have one. I bet that you are also wondering about that sentiment! That is from the Crafty Friends stamp set and it came from one of the monthly kits. Simon Says makes my FAVORITE monthly craft kits. Being a sucker for a craft kit, I’ve tried a lot of different ones and I have always found that the Simon kits are always an AMAZING value. 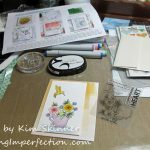 You get inks, specialty papers, card stock, stamp sets, embellishments, tools, patterned paper…the list goes on. I’m never disappointed in these kits. The Cosmos Background stamp was not from a kit, it was from one of the recent monthly releases. I could not resist this one. The number of background techniques that I can do with it alone made it worth the investment. Plus, I have nothing else like it. I love when I get a stamp that is totally different than anything else that I have. I’ve added some Studio Katia Iridescent Bubbles along with a scrap of gold mirror paper. I’m not sure that embossing this and trying to practice the flicking technique with alcohol markers was my best plan, but I do love that it came out super colorful. 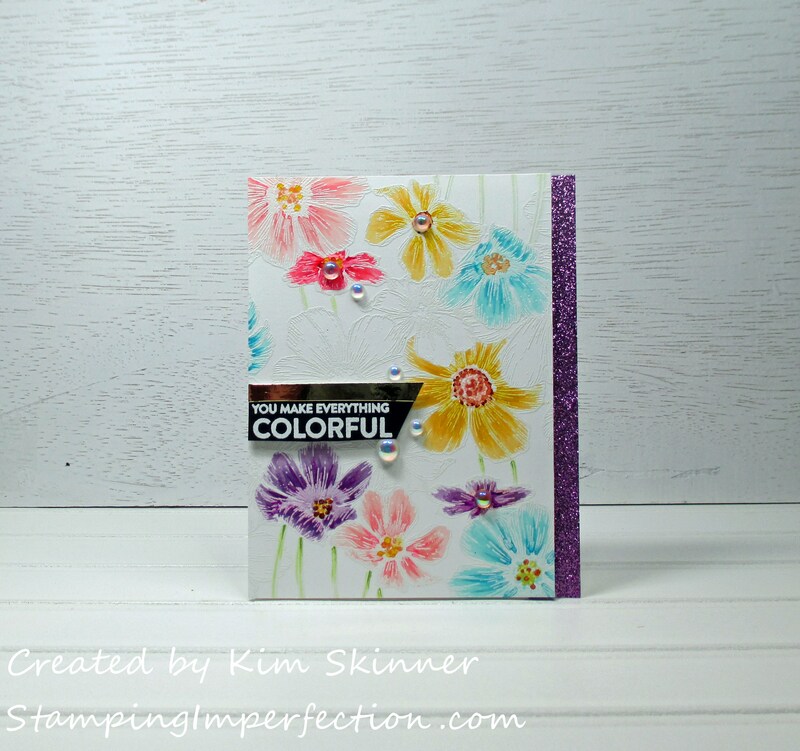 One of the things that I think of when I think of Simon Says is the colorful papers and inks that come in those monthly kits. I couldn’t resist using this sentiment to wish them a happy birthday! Happy Birthday, Simon Says! Thank you for all of the inspiration and the fabulous products!!! Thank you all for stopping by today! I hope you find time to play in your craft space today! So pretty love how you have coloured selected flowers.